“Coffee consumption seems generally safe within usual levels of intake, with summary estimates indicating largest risk reduction for various health outcomes at three to four cups a day, and more likely to benefit health than harm.” – Oh really? Three or four cups a day? Oh really? I knew there was a God! 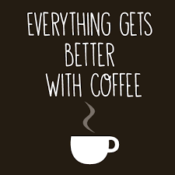 And God must love coffee!